It seemed strange… why did shorn sheep have bigger lambs than their unshorn counterparts? Could lamb birth weight be affected by their shorn mothers' reaction to the cold winters? The original research goes back to shorn versus unshorn ewes, with the pregnant shorn ewes having higher lamb weights (2007, The Cow-Calf Manager). The relationship also exists in cattle, according to a UNL study in the 1990's (Climate Affects Calf Birth Weights and Calving Difficulty,1999 Nebraska Beef Report, PDF 355KB). Researchers are still not clear why spring calving cows in colder winters have larger calf weights, but the study shows that for every 1 degree F decrease in average winter temperature, there is an increase in calf birth weights by 1 pound. The UNL beef researchers studied the effect of colder than normal temperatures on calf birth weights. The six-year study found the coldest winter (11 degrees colder than the warmest winter) resulted in calf birth weights 11 pounds heavier when compared to the warmest winter. The exception was the winter of 1995-1996 when above normal average temperatures resulted in numerically (not statistically) heavier calf birth weights. One possible reason could be the colder than normal temperatures in January when the cows were in their last trimester (the cows calved in mid-February to April 1st). 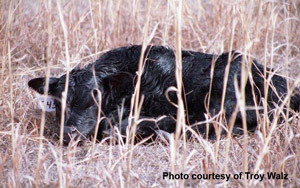 With slightly colder than normal temperatures according to data from the High Plains Regional Climate Center for the last three months and a very cold beginning of February, cattlemen may want to pay special attention this calving season. Richard Randle, DVM and UNL Extension Beef Cattle Veterinarian, says "Increases of five to eight pounds in birth weights due to cold weather in mature cows should not result in dramatic increases of dystocia. However, producers should be aware of the possibility and be observant for potential problems. If extremely large birth weights occur at the start of calving season, then one needs to observe cows more often and intervene sooner in the rest of the cows. If no progress in calving is observed over a 30 to 45 minute time period, then a person should consider intervening. Heifers should definitely be observed more frequently and if a heifer appears to be struggling, don't wait more than 30 minutes to intervene." In addition to potentially larger calves, cows that are energy deficient can be weaker and therefore will take longer to calve because they don't have strong contractions and tend to fatigue quicker. These prolonged calving events can lead to weak and less vigorous calves. So cows, especially thin cows, that don't receive adequate additional feed/supplementation in cold weather will likely be weaker at calving. Colder weather may cause larger calf birth weights. Producers are encouraged to think about the impact it may have on this year's calving season.